When my day is very busy and I don’t have a time to cook I usually go for ADB (All Day Breakfast). In our case it means caramelized smoked ham and pineapple, Maple Syrup beans, eggs and toasted English muffin. Great comfort food any time of a day with one drawback: too many frying pans! One for ham and pineapple; one for eggs and a pot for beans. In a restaurant everything is cooked on a hot griddle, it is quick and easy. I don’t think that I have to write a recipe; picture is worth a 1000 words, right? This is my kind of breakfast. WITH BEANS, definitely a plus in my book. It must be Maple Syrup beans on my plate!!! 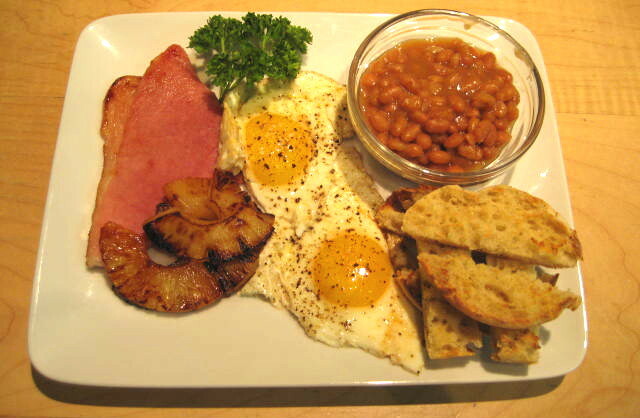 And to hit ham with maple syrup doesn't hurt either, ne se pas?